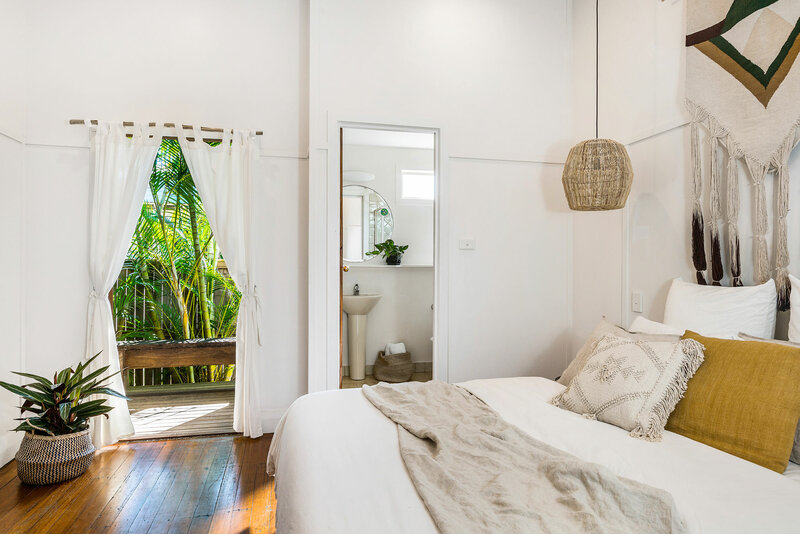 Staying at Bamboo Beach House means coming home every day through a leafy, green neighbourhood just minutes from both the beach and town centre in Byron Bay. 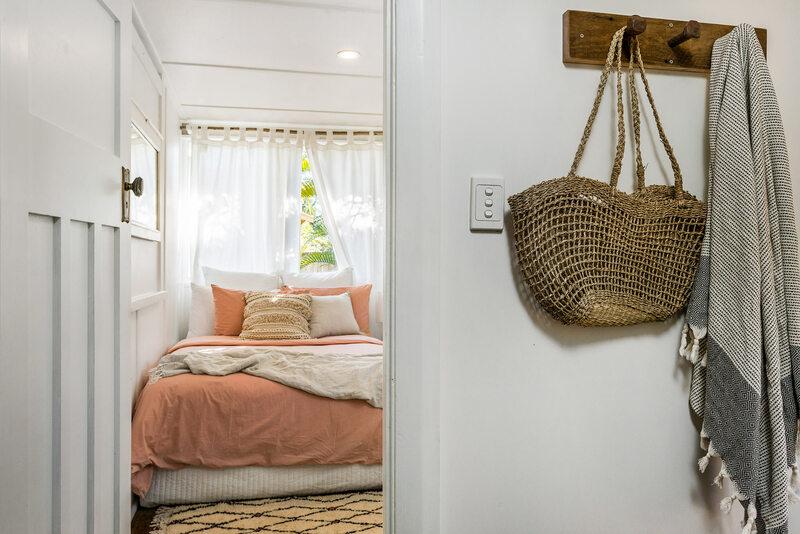 This picture-perfect, pet-friendly beachside cottage is designed with the effortless, Boho-meets-Bali aesthetic that feels so perfectly “Byron.” There’s ample space for everyone with 5 bedrooms plus a separate, self-contained studio, 4 bathrooms, an open-plan living room and kitchen, as well as outdoor deck and entertaining space. 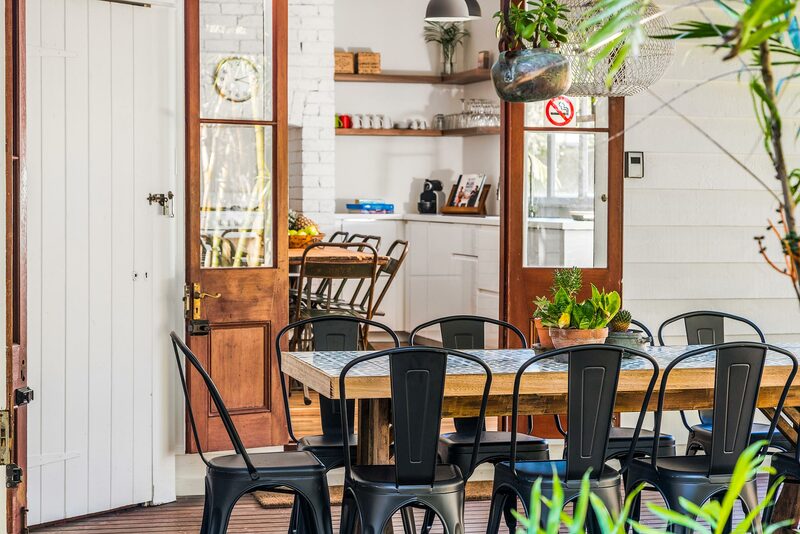 Feel right at home in Byron Bay when you enter the open-plan kitchen, living, and dining room. This is a comfortable place to gather, on the plush sofa or around the reclaimed wood dining table, without separating the chef in your group from any of the conversation. This space also flows naturally into the sunny outdoor deck, which overlooks a peaceful, Balinese-style garden, and offers a BBQ and additional dining table ideal for entertaining. 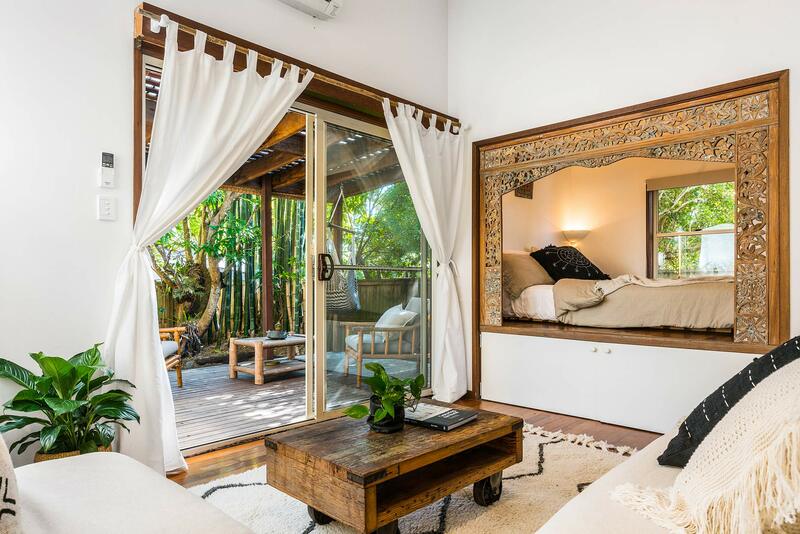 At Bamboo Beach House, you’re never far from all that Byron Bay has to offer. Town Centre is a mere 3-minute stroll away, with world-class dining, boutique shopping, and much more. Surfers of all levels will appreciate the breaks at nearby Main Beach and Belongil, both just a short stroll from Bamboo Beach House. Retreat into the cosy, light-filled living space and sink into a plush sofa or extra-large armchair. Curl up with a soft throw blanket and settle in for a comfortable conversation around the coffee table or a relaxing night watching movies on the Smart TV. Push open the reclaimed wood double doors to let the gentle sea breezes flow in. 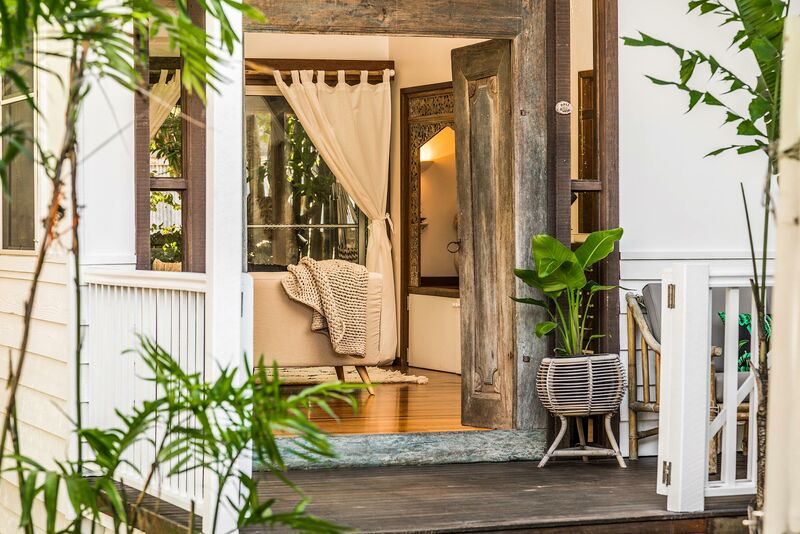 Step out onto the wooden deck and embrace the peaceful vibes of your very own lush, Balinese-inspired, tropical garden. 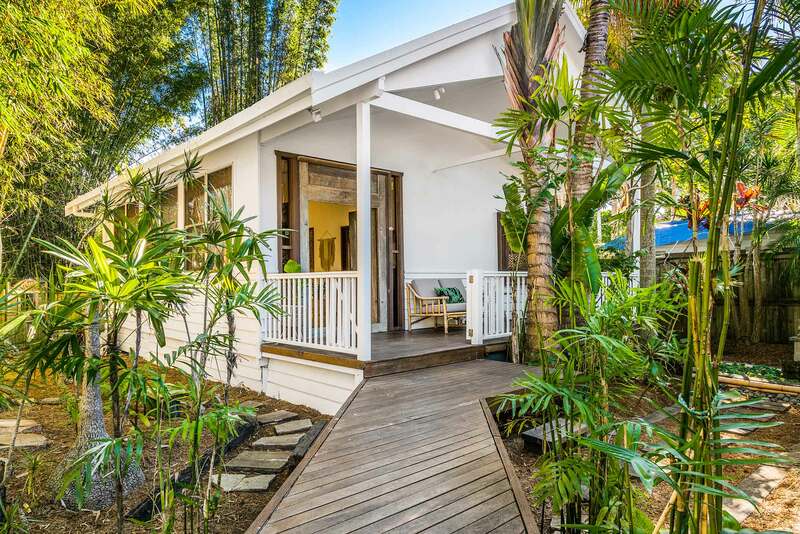 This is truly a space created for relaxed, beachside Byron living at its finest. 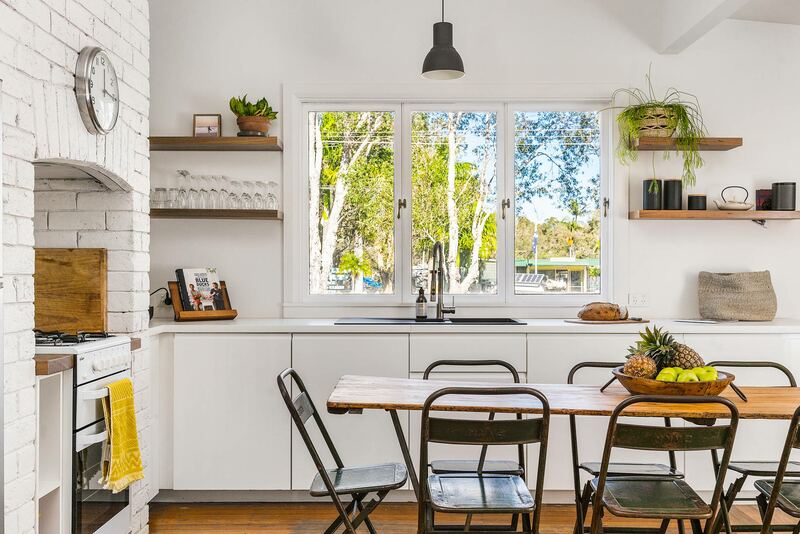 After picking up fresh produce at the nearby Byron Bay farmers markets, you’ll love whipping up a delicious omelette or hearty pasta in the modern, fully-equipped kitchen. 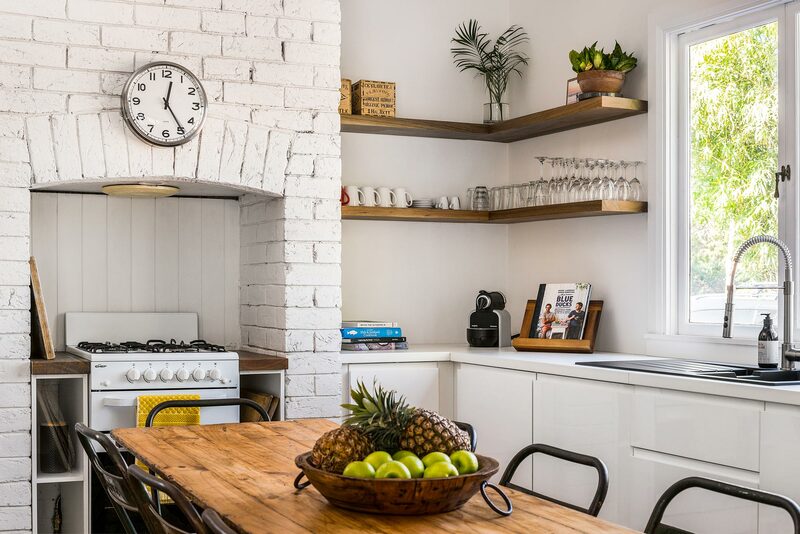 The sleek, white lower cupboards are beautifully accented by open, reclaimed timber shelving above, providing ample storage space for the necessary kitchen bits and bobs. One of the highlights of the space is the old brick fireplace, beautifully refurbished as a recessed nook for the stovetop and oven. More reclaimed timber is used to create the custom dining table, with 8 sleek, industrial-style chairs to match its metal legs. Step inside any of the main house’s 5 bedrooms and feel an instant sense of calm wash over you. 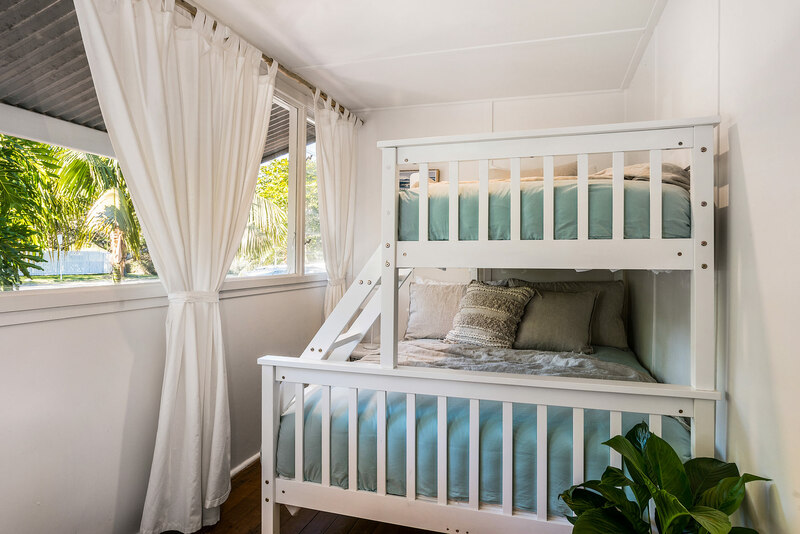 Each space has been thoughtfully decorated in the coastal, Boho design that has become synonymous with Byron Bay. Sink into fluffy, luxurious linens with touches of texture from vintage, Moroccan-inspired throw pillows and soft, woven blankets. Leave the windows open for a gentle sea breeze or simply switch on the ceiling fan to keep cool. Three of the bedrooms feature a queen bed, one has a double, and one has a bunk bed with a double below and a single on top. The largest bedroom in the main house has its own ensuite bathroom with an overhead shower. Two more shared bathrooms are located down the hallway, both smartly appointed with modern finishings and overhead showers. 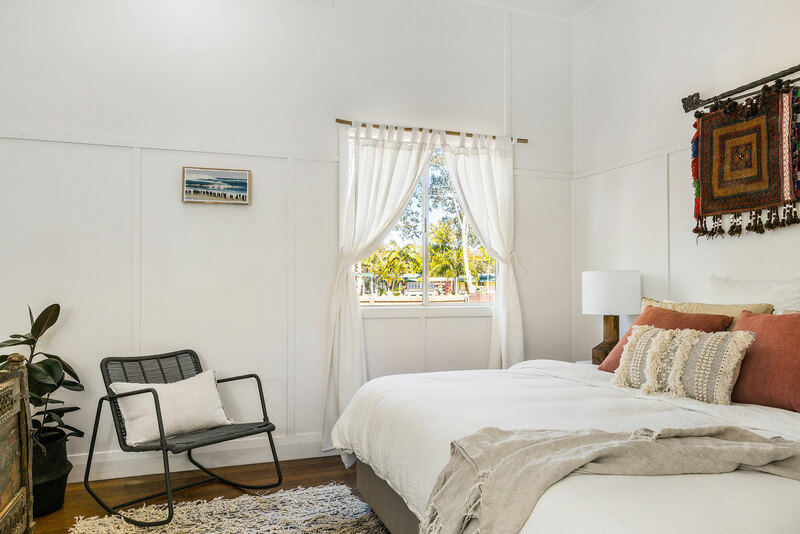 Separate from the main house but accessible via boardwalk, is a completely separate, self-contained air-conditioned studio room with a queen bed recessed into its own cosy nook, with a modern bathroom including luxurious spa bath and shower. The studio also features its own kitchenette and living area, making it the perfect private retreat for a couple. At Bamboo Beach House, discover your own magical Balinese garden right outside your doors. This tropical-feeling oasis feels like stepping into the exotic gardens of Ubud, accented by landscapes of sturdy bamboo, lush flora, Hindu stone figurines, and a traditional Balinese gate. Just off the open-plan kitchen, living, and dining room, the outdoor deck is a beautiful place to host an intimate dinner party or simply relax with a coffee in the morning, feeling the gentle sea breeze and warm sunshine on your skin. The custom-designed, reclaimed wood dining table features a stunning inlaid tile mosaic top and seats up to 10 comfortably. You’ll want to fire up the outdoor BBQ and take advantage of this space every evening! Pets are also welcome at this fantastic pet friendly accommodation with fully fenced outdoor areas to roam safely around the rear of the property. There is space for 4 cars to park off-street. 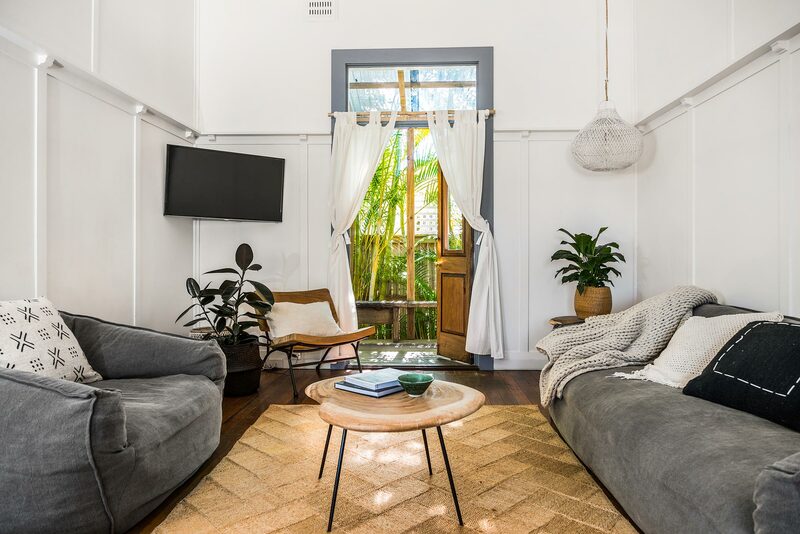 When you stay at Bamboo Beach House, you get to experience the best of lively downtown Byron while feeling like a local in a peaceful, residential neighbourhood. The very best of Byron Bay’s shopping, entertainment, food and drink are just a few minutes’ walk away! Continuing the feeling of living like a local, you are also just a short walk from the weekly Byron Bay farmers market, where you can pick up fresh produce, groceries, and even handmade art so you can bring a bit of Byron back home with you. 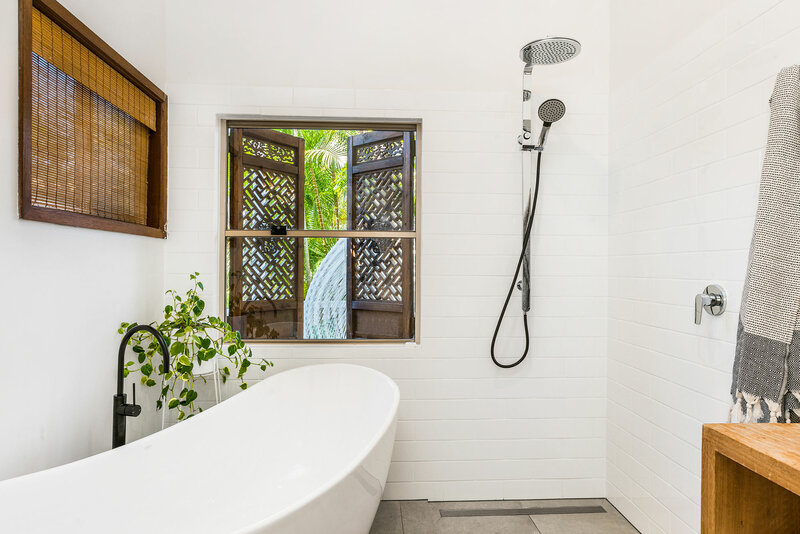 Bamboo Beach House has the benefit of everything on your doorstep, with the added bonus of comfort and privacy being tucked away in a quiet cul-de-sac. There’s so much more to explore in Byron, but surfers and sunbathers alike will love that Main Beach is only 200 metres away. 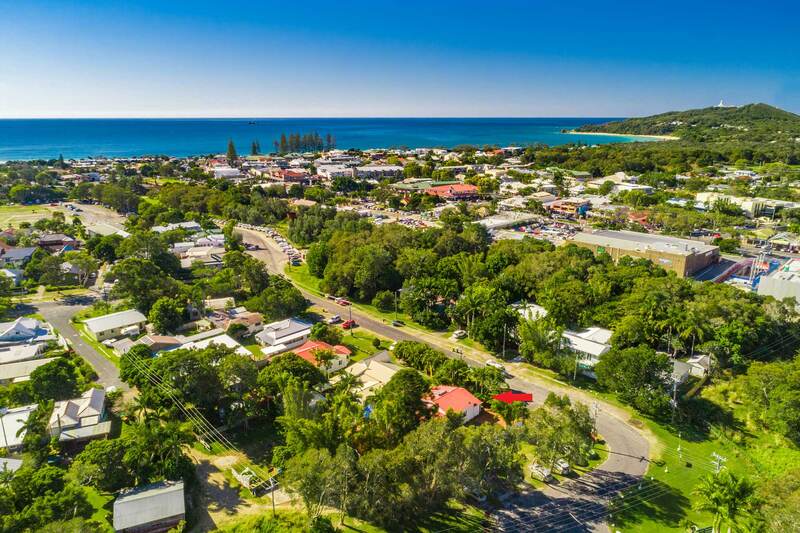 Take a short drive up to the iconic Cape Byron Lighthouse and admire sweeping, panoramic views over the ocean, town, and rolling hinterland valleys. Loved the property and all the thought that went into its furnishings. It was very relaxing haven from all the bustling Byron summer crowds. Staff were very accomdating and friendly. Perfect for large groups and we had fun in this home. 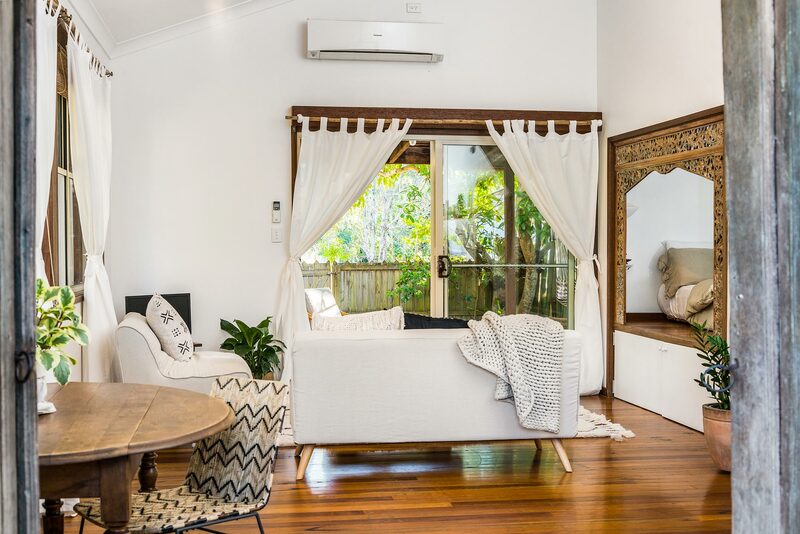 The interiors were wonderful, and we liked that it was near Byron Bay's popular restaurants and shops. Honestly can't get enough of this house! Will be coming back again soon! The house was fantastic. Walking distance to everything & super clean. We loved it!! Thank you 'A Perfect Stay' for making the experience so easy & suitable to our needs. I would use your service again for sure.